Built as a military drinking water carrier,this vehicle went to Alderney in the Channel Islands during1945.In 1947 it was acquired by the States of Guernsey Airport,fitted with a Coventry Climax pump,and used as a fire tender, The engine was a Bedford 6cyl 28hp petrol engine. In 1972 it was transferred to Alderney Airport,where it worked until finally being withdrawn from service in 1977. Now lovingly preserved,this photograph was taken at the Amberley Working Museum Fi re Show in 2007. Pete, you pulled off a great photo in the rain, and all. Is the Coventry Climax pump carried at rear, or between tank and cab? Nice to see a Tanker get its just due, and make it into preservation. Being such simple, functional machines - often on a commercial chassis; they so often get sold off to industry somewhere, eventually ending up, rusted away, in a scrap-yard. 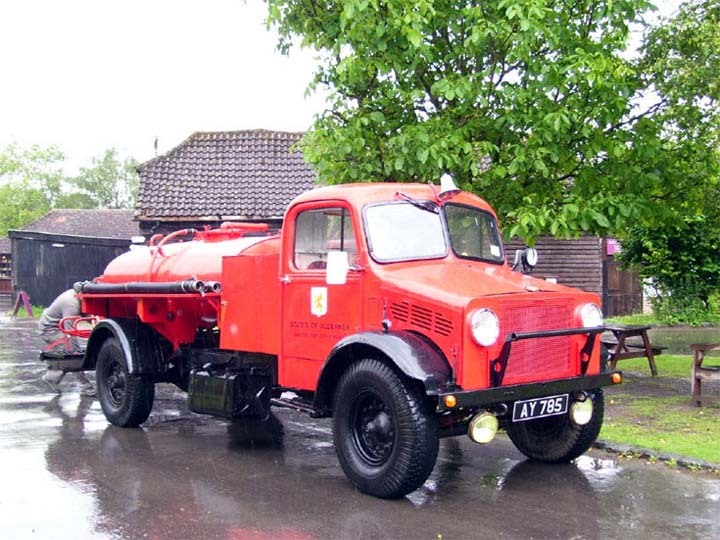 For those of us of the North American "Pumper-and-Tanker" Rural Fire Department bent; Web info, this was a standard British military 3-ton lorry, er, truck, based on a commercial design, about 70, 000 of all types built in WW-2, 2-wheel drive, single rear wheels; and the tank is 500 Imperial Gallons - 2, 275 litres - OK, 600 American Gallons. The 6-cylinder 3.5L gasoline engine is 214 cubic inches. My own FD had a 1980's converted International Oil Tanker. Surprisingly nice lines and a lot of time by the Volunteers with the paint-work, etc made a good-looking piece of apparatus. Filled up, it carried 2200 Imp Gals. on a single rear axle. A bit(!) over-loaded - it was a challenge to get up our steeper hills; and the driver did a lot of shifting with the 10-speed box....in the icey winter, it was a big relief to arrive intact at the fire-scene, with the precious load. Added by Pat_R-B on 04 April 2008.
picture I took of a simular appliance standing next to this one, an old R.A.F. information at the moment, will if its their again year, take another picture. Added by Pete Matten on 08 April 2008.
this year I took more pictures of the same vehicle, and another, a RAF unit. Added by Pete Matten on 07 July 2008. I was just looking at your picture #9036, LH side of this Tanker, and also picture #9037 of the RAF rig - great shots, answers all my questions from above message. And, good to see these historical rigs, saved. I [and, doubtless, countless others] have been really enjoying all your Contri's and Informations - so keep up the good work. Added by Pat Rivers-Bowerman on 26 August 2008.
course the AFS(Auxiliary Fire Service)established 1949 and disbanded in 1968. Added by Pete Matten on 26 August 2008. A recent publication,FIREFIGHTING IN GUERNSEY has a black and white shot of this in its original condition. It was originally at Guernsey airport before going to Alderney. Added by Bob on 02 May 2009. Hi my father William Webster was the chief fire officer in Alderney at the time the Bedford was in service.He sold the vehicle to the artist David Shepard in 1977. Great to see it still running my father would have been very proud as he spent a lot of time keeping it running. Added by Stuart Webster on 07 February 2012. I would like to contact the owner of this appliance, as I am hoping it can attend an event, which I am organising, in the autumn of 2016. I know that, circa 2005, it was owned by Mr. Ray Ellis, of Ashington, West Sussex, but I have no contact details for him. Added by Bill Edwards on 02 February 2016.